Youngest Black Hole Born From Unseen Stellar Explosion. Astronomers using NASA’s Chandra X-ray Observatory have looked at a very unusual supernova remnant which may be home to the most newly formed black hole in our galaxy. Through almost sixty hours of observing, they have pinpointed a unique explosion event which shows matter being rapidly expelled from the poles of a rotating star. Why is this a rare event? When it comes to a massive star, depleting its fuel would seem to trigger the same set of responses – the star collapses and a supernova is born. Usually these cataclysmic explosions are symmetrical – the star’s “guts” splattering pretty much evenly in all directions. However, that isn’t the case with W49B. From the x-ray observations, it would appear the pole regions are spewing out material at a higher rate of speed than that seen at the stellar equator. These jets are responsible for shaping the supernova explosion itself and what’s left is rather “peculiar”. By mapping the distribution and amounts of various elements in the remnant, researchers were able to compare the Chandra data with modeling techniques of known stellar explosions. What they found was asymmetry – uneven distributions of materials such as iron, sulfur and silicon. It’s all a learning experience for the research team. At this point in time, supernova explosions might be a common study, but they still aren’t thoroughly understood. Astronomers are eager to study extreme cases such as the one produced by W49B. Normally when a massive star collapses, it leaves behind a dense, spinning core known as a neutron star. These are highly visible in x-ray emissions and radio pulses… but W49B didn’t leave behind a pulsar. It may have left behind a black hole. Yet, that’s not all. 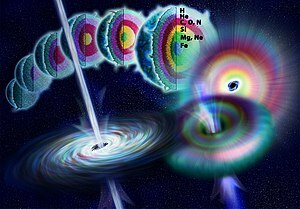 In certain circumstances, supernova explosions which contain jets have been linked with gamma-ray bursts in other objects. These GRBs have only been observed in other distant galaxies, but are surmised to be the progenitor of a newly formed black hole. While there isn’t any evidence that W49B produced a GRB, it certainly has all the hallmarks. Original Story Source: Chandra X-Ray Observatory News Release. Submitted by Tammy Plotner for “Dave Reneke’s World of Space and Astronomy News”. Tele-Robots to Explore The Moon’s Farside?